Today, we take for granted the ability to send photos halfway around the world in an instant. (Which is probably why that popular smartphone photograph service is called Instant-Gram™.) But a century ago, getting a photograph across an ocean was a much more involved process than simply snapping a mirror selfie and publishing it to 3,000 of your closest friends. In the early morning of January 24, 1926 an American oceanliner called the S.S. President Roosevelt was carrying 200 passengers bound for Germany. The Roosevelt received a distress call in the Atlantic Ocean, and the decision was made to go in search of its origins. The call was coming from the S.S. Antinoe, a British freighter ship which had gotten caught up in terrible weather and was on the verge of sinking. The rescue of the crew took three and a half days, and two men died during the effort. But the rest of the crew (including the captain) were saved, and brought aboard the S.S. President Roosevelt for an their unscheduled detour to Germany. As it happens, during the rescue someone on the S.S. President Roosevelt snapped a photo of the sinking Antinoe. Soon after, that same image would be seen in newspapers across the United States. But how did the photograph get from the London to New York City before the existence of things like satellites, smartphones and transatlantic fiber optic cables? 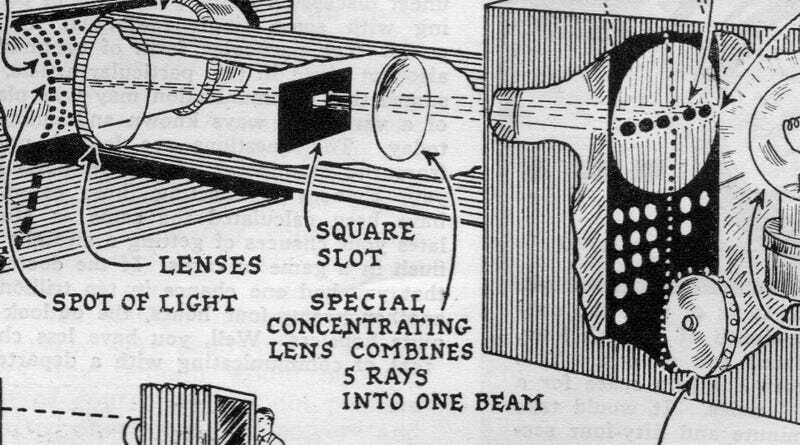 The April 1926 issue of Science and Invention helpfully illustrated the process, detailing everything involved in getting that photograph from London to New York City. As you can see from the caption in the Laredo Times, the way that the photo made its way across the Atlantic was as noteworthy as the rescue itself. And it owed most of the debt to a monster transatlantic cable. A silent newsreel was also produced and distributed by Pathe showing footage of the rescued crew from the S.S. Antinoe some time after the story broke. But those movies were likely delivered around the world the old fashioned way—film dupes made by hand and sent by rail or airplane rather transmitted along the bottom of the ocean. Today, while the average person may be able to send photos with the push of a button, any illustration detailing the technical process of sharing on Instagram would likely be just as involved as the one above. It may seem instantaneous to us, but the distributed nature of the internet and the way that packets of information are split up and reassembled would certainly make for a highly technical picture. Albeit one with fewer magnets.